#68 "More Machine Than Man!" With grinding tracks and squealing gears, the Adeptus Mechanicus receive more reinforcements this week in the shape of the Kataphron Battle Servitors. Gene-bulked, truncated at the waist, welded to tracks and upgraded with devastating weaponry, they bring death and destruction in the name of the Adeptus Mechanicus. You can find out more about them in this week’s issue of White Dwarf, out tomorrow in Games Workshop stores, independent stockists and right here on the Games Workshop webstore. 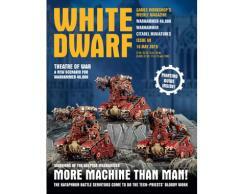 Of course, a true servant of the Omnissiah would download the digital version of White Dwarf from the Black Library website, which can be downloaded direct to your data-slate through the noosphere. But that’s not all you can find in this week’s issue. Alongside painting guides and rules for the Kataphron Battle Servitors, there’s also an article about the forge worlds of the Adeptus Mechanicus, an exclusive Altar of War mission for Warhammer 40,000, a Parade Ground of Nurgle’s filthy followers from the End Times (with some equally disgusting stories), ’Eavy Metal tips for using hot and cold colors and plenty more besides.